This is pretty fun. The first shot is of the control frame view; the second is smoothed - which is how the part would be produced. I'm new at T-spline modeling, and have a few issues with this model. Nonetheless, it's basically ready to be converted into a mechanical assembly. There, it would be split into a frame and arms; hinges would be installed; lens features would be designed. This model took me about 45 minutes. It's basically the first "organic" model I've ever created. 100% T-spline geometry, all on a piece of free software. I started with a single torus on the XY plane for one of the eyepieces. I applied a "Mirror-Duplicate" on the YZ plane, creating a second eyepiece that automatically mirrors whatever I did on the first. 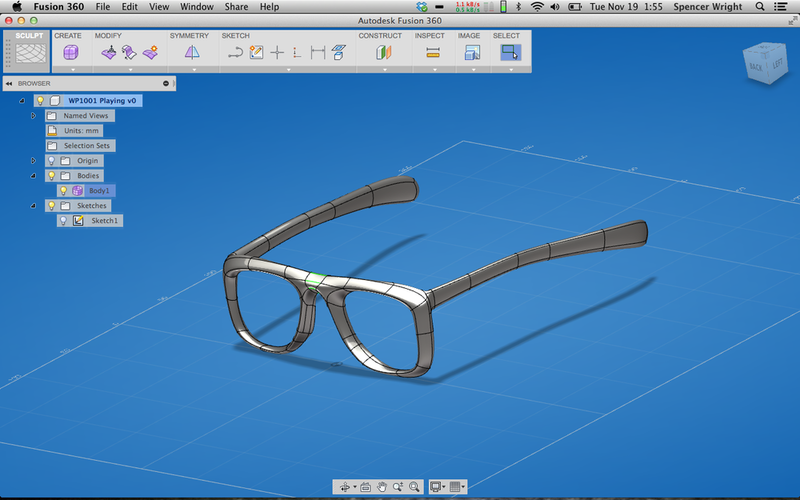 Then I created the only sketch in the entire model - a basic nose bridge, spanning from eyepiece to eyepiece. I created a "Bridge" feature between the two eyepieces, then began to sculpt. A bit into the process, I created the temples by extruding them from the faces closest to the top corners of the eyepieces. At this point, I could export STLs and have this printed as a full scale, physical, part-in-hand mockup. The entire process - from sketching the torus to completing the print - would take about 4.5 hours. Note: I'm assuming you're using FDM (a process I'll begrudgingly accept for quick mockup purposes), e.g. MakerBot, and that your Lean, One-Piece-Flow Supply chain (as it were) is ready and running smoothly.